This ancient surname is generally of early English origins, predating the Anglo-Saxons and Normans. It was usually an occupational name for a person employed by an abbot, or perhaps a nickname for one who was thought to conduct himself like an abbot! It is also possible that in some cases the name may refer to the offspring of an Abbot, however as the clergy were supposed to be celibrate there is an area of doubt. The surname also occurs widely in Scotland where it is either of English origin or a translation of MacNab, which also means 'son of the abbot'. 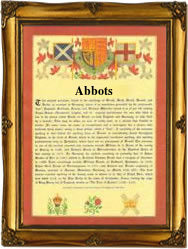 The original spelling was 'abbod', Ralph Abbod being recorded in Somerset in 1272. The patronymic is usually indicated by the suffix 's', and very occasionally as 'Abbotson', Dorothy Abbotson being recorded at St Botolphs Bishopgate, London, on November 11th 1823. The various spellings include such rare forms as Habbett and Labbet. Early recording examples include Walter Abat, in the Assize Court Rolls of Yorkshire in 1219, and George Abbot (1562 - 1633) who was appointed Archbishop of Canterbury in 1611. Elizabeth Abbitt was recorded as 'living in Virginea, over the river' on February 16th 1623, making her one of America's earliest colonists, and Peter Bernard Abbots, also recorded as 'Abts', was christened at St Dunstans in the East, Stepney. Jacob and Isaac Abbots, the twin sons of Isaac and Elizabeth Abbots, were christened at St Mary Whitechapel, London, on March 15th 1727. The Coat of Arms most associated with the name has the blazon of a red field, a gold chevron between three golden pears. The first recorded spelling of the family name is shown to be that of Walter Abbot, which was dated circa 1190, in the Danelaw records of Lincolnshire, during the reign of King Richard 1, known as 'Richard the Lionheart', 1189 - 1199. Surnames became necessary when governments introduced personal taxation. In England this was known as Poll Tax. Throughout the centuries, surnames in every country have continued to "develop" often leading to astonishing variants of the original spelling.